We thought the Bake Off was leaving the BBC forever, but Simon Cowell has a solution. According to the Sun, the media mogul has pitched a new Great British Bake Off-style show to fill the gaping hole in BBC schedules. The Beeb will never have to worry about a Channel 4 takeover again, because Cowell’s new baking show will come with a lifetime contract too. The news comes shortly after the rights to air The Great British Bake Off were bought by Channel 4, leaving its former home on BBC One. Fans were justifiably horrified by the news, which was made all the worse when presenters Mel Giedroyc and Sue Perkins announced they were stepping down. However, many fans will be surprised to learn Cowell could be the BBC’s knight in shining armour, as he is usually associated with long-time rivals ITV. Just last week, Cowell penned a deal with ITV to keep his behemoth entertainment formats The X Factor and Britain’s Got Talent on air until 2019. It looks like he has no qualms talking to other channels about ideas however. We wonder how ITV feels about that. 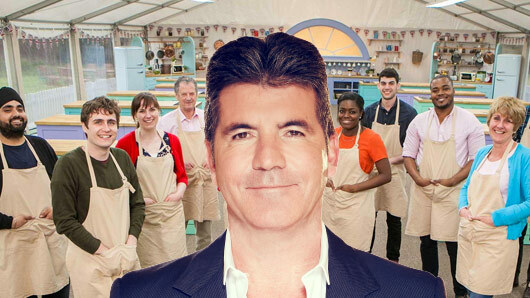 And to be honest, we have to wonder what fresh horror a Simon Cowell-fronting baking format could hold. A public vote? A six cake challenge? Buzzers for judges during the technical challenge? It could all be on our screens soon.